The Boston Chamber Music Society splits its season into trimesters, with the winter component consisting of two sessions at the Fitzgerald Theater within Cambridge Rindge and Latin School. Sunday afternoon was the first of this mini-series, featuring English composers and works spanning the narrow nine-year range 1918-1927. Within the context of World War I, all three compositions displayed an uneasy, Janus-faced sense of quo vadis for a society (and class) pummeled and traumatized by the war. The opening piece was the latest, Arthur Bliss’s Quintet for Oboe and Strings from 1927. It was written—on commission from the American patroness Elizabeth Sprague Coolidge—for the eminent British oboist Léon Goossens, a member of a highly distinguished British musical family originally from Belgium that produced the conductors Eugène senior and junior (Léon’s father), conductor-composer Eugene (Léon’s brother), harpists Sidonie and Marie (his sisters) and hornist Adolphe Anthony, their brother, who was killed on the front at age 20. We don’t know if the latter detail was explicitly on Bliss’s mind in writing the quintet (the composer had also served in the war), but the anguished chromaticism of the long slow introduction to the first movement, and the vehemence of the finale, are quite consistent with a lot of British music of the period that reflects the war, for example Rebecca Clarke’s piano trio. The quintet as a whole seeks a language that integrates modernist harmonic innovations with, most evidently in the wistful middle movement, that very English pastoral tradition inherited from Parry and Vaughan Williams that was being developed by some of the recently fallen, for example George Butterworth, and members of his generation such as John Ireland. Curiously, very much like Vaughan Williams’s Pastoral Symphony (1921), also a World War I elegy, the Bliss quintet shows considerable influence of Ravel. The writing for the quintet subsumes the oboe into the ensemble rather than treating it as a soloist. Peggy Pearson kept her sonority smooth and unassertive, except in the jagged finale, in which she tore through the fabric of stiff-upper-lip decorum. The string complement, comprising violinists Jesse Mills and Judith Eissenberg, violist (and BCMS music director) Marcus Thompson, and cellist Raman Ramakrishnan, cultivated an admirable group sound of suppleness and sonorousness, especially in the haunting and rhapsodic slow movement. The closing item in the concert’s forepart was another relative scarcity on the Boston concert stages, the Sonata for Viola and Piano (1922) by Arnold Bax (1883-1953). This is another very strong composition that deserves to be heard more often (we couldn’t find any record of a local performance since 2009 in the BMInt database), the opening movement is haunted, dreamy, lyrical and rueful, with a rhythmic motif, ably brought out by violist Dimitri Murrath, suggestive of the Brahms first sonata (in the same key, G major). The pungent, acerbic middle movement bursts into a furious macabre dance, then dabbles in hints of Irish folk styles (the Irish influence on Bax had actually started to wane after the war), but the rapid piano passagework (nimbly executed by Rieko Aizawa) never lets the listener forget the turmoil underlying the movement. The finale, a soulful dirge, provides a striking conclusion in which both performers, especially Aizawa in the musical climax, conveyed a passionate intensity before the music subsides with a recap of the sonata’s opening melody. The closing work was the most familiar, though far from a staple, the Piano Quintet in A minor, op. 84 (1918) by Edward Elgar. Although carelessly thought by many to be a particularly English musical avatar, Elgar really was more connected to the broad pan-European musical tradition; for example, he didn’t much go in for the fashion of using English or other British folk idioms. This wide view gains special poignancy in the Piano Quintet, where Elgar makes specific reference to the heyday of Viennese centrality in light of the war’s devastating consequences (give him credit for prescience as well, since the war wasn’t even over yet when he wrote the quintet). It begins with and is overshadowed by one of the spookiest motifs to come from anybody’s pen since Beethoven’s Ghost trio, brilliantly conveyed by the ensemble of Aizawa, Mills, Eissenberg, Murrath and Ramakrishnan, followed by a sighing motif leading to the vigorous opening tune based on the “spook” idea. What follows this is rather unexpected: an intermediate tune that some, including program annotator Aaron Grad, thought was Spanish in flavor, but which we have always seen as a Hungarian-laced lead-in to the very Viennese second subject. The sense here is of a European civilization torn asunder, leaving its heirs (like Elgar, feeling a very Brahmsian sense of regret) rootless. The moving, wistful slow movement, Brahms with English characteristics, enhances the lament through an especially poetic climax heavy on the lower strings, for which Murrath’s and Ramakrishnan’s plummy resonance carried the idea to great heights. The finale, after the sighs from the first movement return, presents a theme of great nobility and dignity (an Elgar hallmark) in A major, with a cheerfully syncopated second subject, whose general uplift is partly undercut by the intrusion of themes from the first movement, which the finale’s themes then try to shake off with a resolute face to the future. This was an exceptionally fine, committed, straight-to-the-heart performance by all involved; we only wish the sonics of Fitzgerald Theater were less distant and more intimate, as this music presents an intensely inward and personal communication that needs to envelop the listener. As a postscript to describing this excellent concert, it behooves us to take some issue with comments in Grad’s program notes. It is really not necessary to pump up the significance and quality of late-19th and early-20th century British music by perpetuating the silly canard of “the land without music” (he didn’t use that phrase, but espoused the same sentiment) that has been so thoroughly discredited by modern reinvestigation. 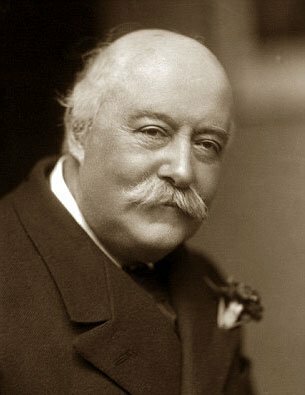 It’s ludicrous to say that Elgar was the first important English composer after Purcell, and even more so to suggest that people like Bliss and Bax, as good as they were, shone more brightly than Thomas Arne, William Byrd, Arthur Sullivan (libretto aside, Ivanhoe was a great opera), Hubert Parry (his symphonies are superlative and are direct precursors to Elgar, albeit more cheerful), Charles Stanford, and even the young William Sterndale Bennett. It’s great for program notes to provide historical background, but spinning spurious mythology doesn’t cut it.